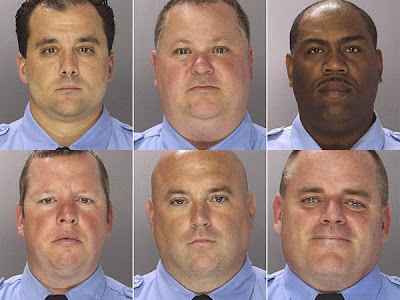 Veteran crime reporter and author Ralph Cipriano is covering the federal trial of six Philadelphia narcotics cops (seen in the above Philadelphia Police photos) for bigtrial.net. When the jury foreman sat down, there was a roar of approval from courtroom spectators that could be heard out in the hallway. After a ten-month legal ordeal, all six defendants were getting ready to walk out of the federal courthouse as free men. ... For the alleged rogue cops, the ordeal began on July 30, 2014, when the FBI raided the officers' homes at 5 a.m., with guns drawn. The six members of the narcotics field unit were charged in a 26-count federal indictment with allegedly using their positions to run a criminal enterprise. The rogue cops, the feds said, robbed and beat drug dealers they arrested out of at least $500,000 worth of cash and drugs. The money and drugs were allegedly stolen over a six-year period, between 2006 and 2012. The feds also accused the cops of falsifying police reports to cover their tracks. It was a case with plenty of rhetorical flourishes endlessly replayed in the media. The rogue cops, the feds said, supposedly dangled a couple of drug dealers by their feet off of high balconies. The rogue cops allegedly used sledgehammers to blow open doors. They allegedly beat one drug dealer, Wayne Layre, with a steel bar in the back of the head and kicked in his his teeth. They allegedly kidnapped another drug dealer and held him hostage, and they allegedly extorted other drug dealers. They allegedly stole Rolex watches, iPods, a Calvin Klein suit, even $6,000 of somebody's flood relief money.